Followers of this blog likely know that British journalist Yasmin Alibhai-Brown does not have a very good track record when addressing issues relating to Israel, Jews or antisemitism. In a 2006 Independent op-ed, Alibhai-Brown claimed that Israel’s war against Hezbollah was motivated primarily by (Nazi-style) racism against Arabs, and further decried “hardened Zionists” who are so blinded by this hatred that they’re “unmoved by photos of dead infants in Beirut”. In 2009 at the Independent, she complained that major British political parties were “lavishly entertained” by the “over-influential Friends of Israel”. In a 2012 Independent op-ed, she defended Baroness Jenny Tonge after she told a student group that “Israel won’t be here forever”, and claimed Tonge was unfairly “savaged by Zionists”. At the Independent in 2014, she attacked “hardline Zionists”of engaging in “paranoia, indiscriminate loyalty and odium towards any person or group opposed to Israel’s violent oppression of Palestinians”. She also seemed to compare jihadist attacks with the actions of the IDF and accused Israel of engaging in a plan of genocide. A 2015 op-ed in the Independent, she seemed to suggest that “hard Zionists” were part of a conspiracy to smear the reputation of Jeremy Corbyn while he was running for Labour leader – and even defended the work of antisemitic cartoonist Carlos Latuff. (It appears that the Independent took down the op-ed, but you can see it here.) She also erroneously claimed that one of Corbyn’s backers, Ken Loach, is Jewish. In her latest op-ed, published Aug. 24th at the newspaper i, about “rampant censorship” in Britain, Alibhai-Brown again goes after “hardline Zionists” as an example of “minority communities” that “can be authoritarian and frighteningly controlling”. Westerners are convinced that freedom of expression, their inviolable birthright, is endangered by pesky incomers from backward places who are contemptuous of European enlightenment values. Now there’s some justification for these set ideas. In recent years there have been murderous attacks by intolerant Muslims on cartoonists, bloggers and artists. Hindu and Sikh fundamentalists and hardline Zionists have also objected to events, debates, theatrical productions and lectures. Organised intimidation has led to cancellations or withdrawal of artworks. First, note how she conflates deadly Islamic terror attacks on cartoonists, bloggers and artists with the putative “objections” expressed by “hardline” British Zionists (or Jews) to unspecified “events, debates, theatrical productions and lectures”. Additionally, it’s impossible to know what her vague accusation of “organized intimidation” by “hardline” British Zionists is alluding to. This May, Leanne Mohamad, a 17-year-old British-Palestinian pupil at Wanstead High School won a regional final in a Speak Out competition. Her talk was on the ongoing pain of Palestine. The Speaker’s Trust denied her a place in the finals. The video of her speech was taken off the official website (it has now been reinstated). However, as the CEO of Speakers Trust made clear, Leanne Mohamad was denied a place in the finals because her speech was deemed by judges to be inconsistent with two ground rules: that the speech must have a “positive and uplifting message” and that a speaker should never engage in propaganda or in any way “inflame or offend the audience or insult others”. (See the lies and propaganda about Israel in her speech in this video and judge for yourself.) Either way, “hardline Zionists” had absolutely nothing to do with her failure to secure a place in the finals. So, while Alibhai-Brown provided no actual examples of “censorship” or “intimidation” by “hardline Zionists” in her op-ed, she did provide another perfectly clear example of her penchant for smearing British Jewish supporters of Israel with false accusations of racism, intolerance and extremism. Alibhai-Brown is by her own admission (Dateline London, BBC News, within the last year or so, but I can’t remember the date), a member of ‘a small Shia sect’. She failed to elaborate so can’t say whether or not she is an Ismaili, although I suspect so, as she is apparently married to a non-Muslim man, something usually forbidden in Islam but permitted by the Ishmailis. It is a complete mystery to me why any newspaper or current affairs program would want or need her entirely negative comments on anything to do with the West. This is the woman who once said Israel is worse than Isis. 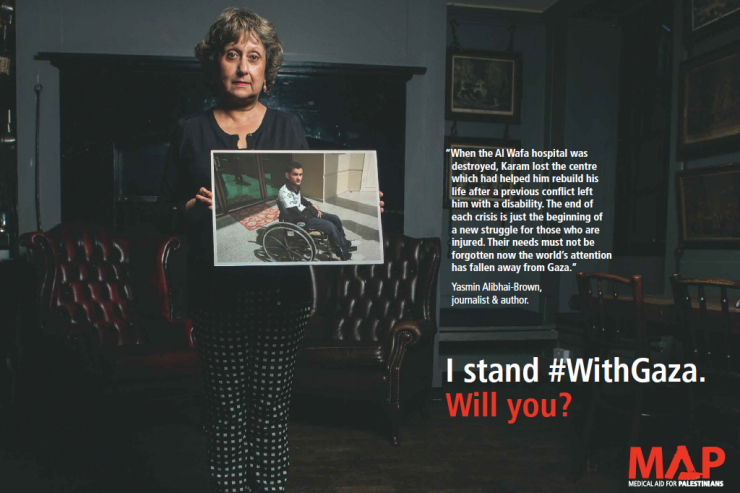 To Yasmin Alibhai-Brown I say… Happy Eternal Nakba! The Leanne Mohamad incident was clear: antisemitism masquerading as pity for the Pals. And the MSM falls for it every time. The Celtic football inicident is typical. The Celtic fans knew they couldn’t get away with Nazi uniforms so they went for the next best thing, the Pally flag. But she will have achieved her real aim, which is to implant/reinforce the idea in her readers’ consciousness that ‘hardline Zionists’ are on a par with violent Islamists. She is NOT a journalist. She is a revolting bigotry-factory. Her behaviour in the country that offered her sanctuary is sick and sickening. Much more serious are the actions of Jake-Wallis Simons and Ruth Smeeth. What ”..actions of Jake-Wallis Simons and Ruth Smeeth” are you referring to? Who, or what have they damaged or smeared with these alleged ‘serious actions’? Margrain if you are referring to Ruth Smeeth MP, she is an elected member of the House of Commons and entitled to be referred to as Ruth Smeeth MP. To do otherwise is not only grossly disrespectful to her but also to those who elected her. When did Jake-Wallis Simons, acquire a hyphen between his first two names? Wikileaks revealed that Smeeth is an Israeli firster and CIA operative and Wallis-Simons admitted that should a war break out between the UK and Israel, he would fight for the latter. Matron quick, the drooling clown Margrain is out of the padded cell hearing voices and burbling nonsense. Time for his medication before he self-harms himself some more by making himself seem even more ridiculous than nature intended him to be.